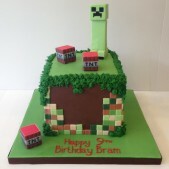 Children’s birthday cakes are the undisputed centrepiece of any birthday party, and a Minecraft birthday cake may just be the thing to make your child’s eyes light up on his or her special day. Since its release 7 years ago, the online game Minecraft has become a worldwide sensation, captivating a generation of children with the seemingly endless possibilities of this open ended building game. If your child spends hours at a time digging virtual holes to collect blocks, a Minecraft birthday cake is bound to be a winner. Cutting the birthday cake is the highlight of any party celebration. At Cakes by Robin, we take birthday cakes very seriously indeed. As one of the leading cake design companies in London, we have a reputation for being original and creative in everything we do. All our children’s birthday cakes are tailor made to your requirements, with the sole purpose of delighting the birthday boy or birthday girl. Whether your child can’t get enough of Minecraft, is a fan of Star Wars or Frozen, loves sports or superheroes, Peppa Pig or Disney Princesses, we can design a fun birthday cake that will exceed all expectations. Robin and her creative team are passionate bakers, cake designers and sugarcraft experts with many years’ experience of creating truly spectacular cakes for all occasions. Nothing is too ambitious and we are happy to incorporate any ideas you may have to produce the perfect Minecraft birthday cake for your son or daughter. How about recreating a particular Minecraft landscape, building or item conjured up by your child? Each one of our bespoke Minecraft birthday cake designs will be totally unique. Of course, we can also personalise any of our children’s cakes with birthday messages and names – just let us know your wishes and leave the rest to us. Obviously, your special Minecraft birthday cake needs to taste as good as it looks, which is why we have a selection of delicious Flavours and Fillings for you to choose from, including the all-time favourite Vanilla Victoria Sponge and the ever popular Chocolate Fudge cake. All our bespoke cakes are handmade by our experienced in-house team. 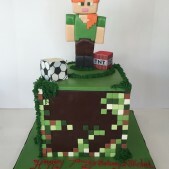 We are always mindful of food sensitivities and special dietary requirements for both children and adults, and are happy to create a Gluten Free Minecraft birthday cake if required, so that all party guests can enjoy a slice of Minecraft party fun. Please do not hesitate to contact us with your particular dietary requirements; we promise to do our best to accommodate your needs wherever possible. 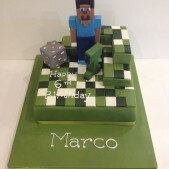 The price of your Minecraft birthday cake will depend on the exact design and complexity of the cake design, with a cake for 15-20 portions that is topped with a sugar character model coming in at around the £450 mark. Please feel free to speak to our professional cake design team to discuss your individual requirements and obtain an accurate quotation. Cakes by Robin designs and perfects each made-to-order cake at our studio in South West London. 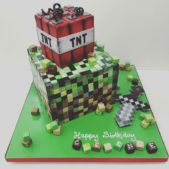 We offer free delivery of our Minecraft birthday cakes to all locations in the London area, with full delivery details available on our Cake Delivery page. Alternatively, you can collect your Minecraft cake directly from our Cakes Parlour, which is situated a short stroll from Southfields Underground Station in Wimbledon SW18. Please be advised that local London parking restrictions may apply. Our Cakes Parlour is open every day and also serves a scrumptious selection of ready-to-eat patisserie cakes, cupcakes and cookies – you’re welcome to pop in anytime.